They’ve been called trophy kids, entitled, narcissistic, the worst employees in history, and even the dumbest generation. But, argues David D. Burstein, the Millennial Generation’s unique blend of civic idealism and savvy pragmatism, combined with their seamless ability to navigate the fast-paced twenty-first-century world, will enable them to overcome the short-term challenges of a deeply divided nation and begin to address our world’s long-term challenges. With eighty million Millennials (people who are today eighteen to thirty years old) coming of age and emerging as leaders, this is the largest generation in U.S. history, and by 2020, its members will represent one out of every three adults in the country. They are more ethnically and racially diverse than their elders, and they are the first generation to come of age in a truly global world and in the new digital era. Millennials have also begun their careers in the midst of a recession that has seen record youth unemployment levels, yet they remain optimistic about their future. 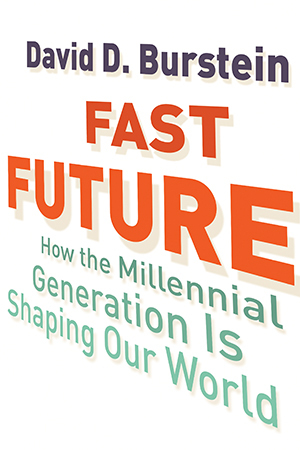 Drawing on extensive interviews with his Millennial peers and on compelling new research, Burstein illustrates how his generation is simultaneously shaping and being shaped by a fast-changing world. Part oral history, part social documentary, Fast Future reveals the impact and story of the Millennial Generation—in its own words. In the fall of my sophomore year in high school, two friends approached me with an idea. Many of our peers in film class had produced great work, but there was nowhere beyond the classroom where these films could be shown. We had a solution: create a first-of-its-kind film festival exclusively for high school students. It sounded like a fantastic idea, and we couldn’t wait to get started. During the next seven months we built a team, raised thousands of dollars, gathered submissions from around the world, secured corporate sponsors, and convinced a local movie theater to donate their venue to us. In May 2004, the first Westport Youth Film Festival took place. We screened sixty films, and hundreds of people flocked to see the work of young filmmakers they did not know. It was a success. And it has lived on: I’m happy to say that the festival will celebrate its tenth anniversary this year. This story illustrates two things that I think are unique about my generation. First, looking back on it, I find it remarkable that not one of my collaborators ever stopped to ask, “Can we do this” We never thought, “We’re just high school kids, we can’t put on a film festival.” We had no earthly idea how to go about it. But we learned how to do it quite well by “bootstrapping,” a term from today’s entrepreneurial language that we would have used then if we had known it. Just two decades ago, it was unusual for high school students to start their own organizations, businesses, and initiatives. But, as you’ll see throughout this book, today it has become far more common. The fact that a group of fifteen- and sixteen-year-olds believed we could create a film festival without any prior experience is a true testament to our generation’s potential. The second thing that strikes me was the sophistication, quality, and content of the films we screened. Most of the films were thoughtful and dealt with important, relevant themes. We screened films that dealt with gang violence in students’ neighborhoods, teen suicide, drugs, and education. One student made a documentary about her parents’ interracial marriage. Even the comedies were smart and original rather than sophomoric. Devoted young filmmakers have been able to create their own work for several decades, but the new affordability and accessibility of film technology and tools have allowed virtually everyone to be a creator, and many are creating meaningful content. The following November, I invited two dozen friends (many of whom were part of the festival team) over for an election-night party. There was pizza, popcorn, soda, and the self-caricaturing madness that is cable news election coverage. We watched as each set of polls closed and results were projected state by state. All the safe states for Kerry and Bush were called first, putting Kerry at a mathematical Electoral College advantage. It was a school night, so my friends peeled off and left by midnight, even though the outcome was still unclear and the biggest states were yet to be decided. We were all expecting that young people would turn out at the levels so many youth activists had hoped and worked for. But the anchors and pundits declared it another disappointing turnout by young voters. While I couldn’t yet vote, the 2004 election was the first in which I could understand the details of the election and the candidates. I understood the importance of the youth vote. I also knew that young people did not have an impressive record of participation. When the final numbers came in for the 2004 presidential election, youth turnout was actually up 11 percent from 2000. Even so, that meant that just 48 percent of young voters had voted in 2004. Beyond my frustration with turnout levels, and with the media calling a substantial 11 percent increase in turnout “another failure of the youth,” I was most concerned with the implications: a few hundred thousand more young voters could have changed the course of history. My high school peers and I were active and engaged. We cared about politics and policy. While I knew the same was not universally true of my generation--indeed, it wasn’t even true for everyone in my school--I also knew that if we didn’t step up, our generation’s voice would get shut out of the political process. If the crucial connection between our future and our vote could be made clearer, our generation could become a political powerhouse. It was then that I decided to throw myself into what would become a massive effort to turn out young voters in the next presidential election in 2008. Setting out in 2005 armed with nothing but a camera and a big idea, I began work on a documentary film called 18 in v´08, designed to encourage my peers to vote. In retrospect, I realize I never paused to ask how to make a film, I just started doing it. I traveled all over the country, interviewing a cast of over one hundred political leaders and thinkers, including senators Barbara Boxer, Robert Byrd, Chris Dodd, John Kerry, Joe Lieberman, and John McCain, Representative John Lewis, Governor Jeb Bush, Newark mayor Cory Booker, strategist James Carville, General Wesley Clark, and Academy Award¬±winning actor Richard Dreyfuss, as well as many young people from communities all over America. The thirty-five-minute film that resulted premiered in 2007. Soon afterward, I created a nonpartisan, not-for-profit organization, now called Generation18, that used the film to register, engage, and mobilize young voters. We held over 1,000 screenings, each followed by discussions and voter registration. Ultimately, we registered some 25,000 new voters, developed a celebrity get-out-the-vote public service announcement series, and 18 in v´08 was adopted in educational curriculums across the country. I was asked to explain young Americans’ political attitudes to visiting foreign correspondents writing about the United States election. I met with government officials from Botswana to help them figure out how to bolster youth involvement in their country. As I traveled our country, I was continually inspired and reminded of the power, promise, and potency of my generation. Much of what I was doing then and continue to do today was not possible for a young person to do just a few decades ago. The technological, media, and social networking tools we have available to us, and the recognition and respect now afforded to young people, have combined to provide my generation with incredible new opportunities. As the campaign drew to a close, something else started to come into focus. I saw that my generation was reshaping areas outside of politics. I met members of my generation who were starting new kinds of businesses, organizations, and initiatives in record numbers. Their experiences turned out to be neither aberrational, nor occasional like the election cycle. While the national media had been focused on the role of young people in the election, a much bigger and largely unreported story had been unfolding. In these pages, I’m eager to share this story with you. Removing all of my own bias is impossible, but there is no better way to understand a generation than to hear about its experiences and worldview straight from the people who are in it.